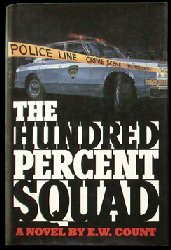 Count gathered material for this tense, sizzling police procedural by pounding the turf with a real-life NYPD detective squad that claims a 100 record in solving homicide cases (at least for three years running). Manhattan police lieutenant Andy Flynn gets on the wrong side of a ruthless, well-connected cocaine lord with pull on the City Council. Soon Flynn has a transfer hanging over his head; he’s given just weeks to solve a series of brutal, drug-related murders. His squad, an “ethnic rogues’ gallery,” includes a pot-bellied “prince of polyester” and a half-black, half-Latino loner, yet the characterizations rise above stereotypes. Flynn’s girlfriend, Lauren, an Upper West Sider with a civic conscience, supports his excessive dedication to his job, unlike his ex-wife, who threw him out. With nonstop suspense, this one hits you like heat rising from the asphalt. Count sympathetically portrays New York’s diverse neighborhoods, police work andthe ravages of the drug epidemic on participants and bystanders. TV rights to Columbia Pictures Television.